My whole family has become addicted. I was the last to get hooked; S. and P. both picked it the habit at Christmas, but I managed to hold out for three whole months. Now, we’re more or less quarantined in the TV room, taking turns feeding the monkey until the batteries on our Nintendo Switch run out. The monkey is called The Legend of Zelda: Breath of the Wild. I was a Nintendo kid — first NES at Christmas 1986, when I was 12 years old, then a GameBoy a few years later. I didn’t follow up with all the subsequent consoles, partly because one friend or another usually got them for Christmas, so I could play over at their houses. But I also lost interest around 1989, when I entered high school. I continued to play video games on my Amiga 500, but it felt like there was something inherently childish about the bright, blocky, cheerful world of Nintendo. Not all the games were cheerful, mind you. One of my favourites was Castlevania, a grueling side-scroller in which you (in the role of Simon Belmont, the descendant of a long line of vampire slayers) get buffeted mercilessly by zombies, ghosts, fish-monsters, mummies, and medusae. Also, bats. I also played a lot of Ghosts ‘n Goblins, which had essentially the same plot except you played a knight (Sir Arthur) who lost his armour (revealing his underwear) whenever he got hit by an enemy (usually bats). But for all my flirtations with the dark, edgy side of console gaming, my prepubescent heart belonged to Super Mario Bros., a game which first seduced me in the Wizard’s Castle arcade at West Edmonton Mall. I loved everything about it, from Mario’s triumphant, fist-in-the-air jumping style to the jubilant soundtrack. I loved its seeming endlessness — as “World 1-1” gave way to “World 1-2” and eventually Worlds 2-1, 3-2, 6-4, etc., it felt as if an entire universe of smashable blocks and stompable foes were being sprinkled ahead of me, just beyond the screen, by some benevolent 8-bit god. Alas, all video games are finite (Super Mario‘s final level — the one with the actual kidnapped Princess — is World 8-4). And that’s another reason I ultimately put video games on the shelf. I loved the immersion that a good video game can provide, and occasionally you’d even find one with a half-decent storyline, but they could never be truly interactive in the way I craved. So I divorced NES and married D&D, because tabletop role-playing, which involves zero bits but 100% imaginative engagement, can go on forever — providing your players don’t find girlfriends. I barely played any video games in my 20s and 30s. When I moved to Cape Breton (I was 34), I bought an XBox, mostly so I could play Mass Effect, which my friend David had helped to create. I admired how far the artform had come since Castlevania, but my experience with them felt different. It was no longer a love affair; now, as I poured hours, days, weeks into the epic grind of a Bioware masterpiece like Mass Effect or Dragon Age, it began to feel more like an addiction. Mind you, I was struggling with other addictions at the same time, not to mention experiencing a major uprooting, a new job, and shortly thereafter a child. I suspect it was mostly parenthood that put an end to my second-wave gaming days, but it was just as well; for all I appreciated the XBox games, my heart just wasn’t in it. Flash-foward another eight years, and I find myself buying a series of Christmas gifts for my own child. First, it was a handheld Nintendo 2DS in 2015, to ease her own uprooting the following year when we moved temporarily to France for S’s sabbatical. Then, it was a shiny new Switch console in 2017, with Zelda: Breath of the Wild and the great-great-great-grandchild of Super Mario Bros., a ridiculously delightful game called Super Mario Odyssey. I played all the way through Odyssey with a rapt six-year-old at my side, then turned my attention to this other game that S. couldn’t seem to stop playing. Zelda has almost as long a legacy as Mario, but I never played the original games, so it lacked the nostalgia. But I knew how skillfully designed those games could be: the year before, in France, I’d played my way through another Zelda game on the 2DS, and it clearly deserved its title as one of the greatest video games of all time. The story of each Zelda link is a bit different, but they all focus on Link, a chosen-one holy fool in a bright green cap who traverses vast lands and solves ancient puzzles in order to (you guessed it!) rescue a princess. They combine lush graphics with intricate world-building, and manage to tell a story worthy of the D&D table. No wonder P’s nascent imagination glommed on to it as an ideal escape from the culture shock of France. Soon, she was eating/sleeping/breathing Zelda, inventing endless, rolling games as we walked or trained around Europe. When we finally finished the game, I commissioned a piece of artwork from a friend, depicting P. as Link. So yes, Breath of the Wild was predictably a big deal in our house. But I didn’t expect to get quite so deeply sucked into it. It’s insidiously well crafted, offering you new surprises and challenges around every rock and past every tree. It’s also freaking gorgeous, with realistic weather effects and wildlife that make the wilderness breathe, as the name suggests. Yet, even with so much to recommend it, I’m a bit alarmed by how quickly and deeply I’ve sunk into it over the past week or two, stealing lunch hours and committing to late-night binges that don’t do me any favours during the end-of-term crush. This morning, as I sat trying to compose a “challenge statement” that would spur my city’s government on to do something, anything, about climate change, I figured it out. 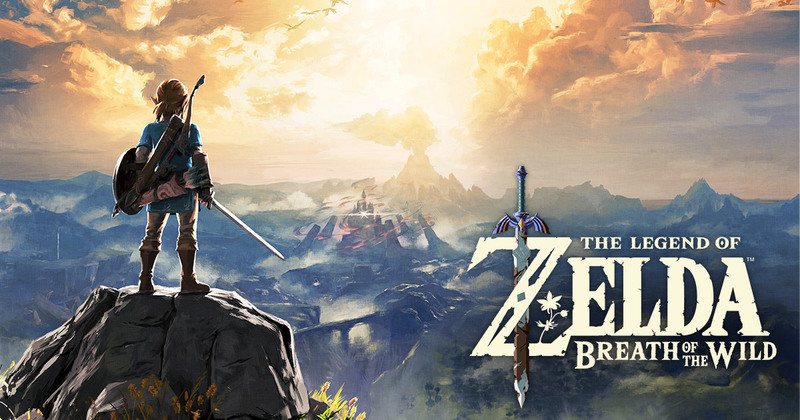 I realized why Breath of the Wild is such a perfect escape for me in 2018. Like previous Zelda games, BotW casts the player as Link the warrior-hero — but this time, you’re an amnesiac, waking up after 100 years of techno-magical stasis. And instead of defeating a great evil that threatens to destroy Hyrule, you need to confront a great evil that already destroyed the world as you know it, plunging Hyrule into post-apocalyptic agrarianism for a century. 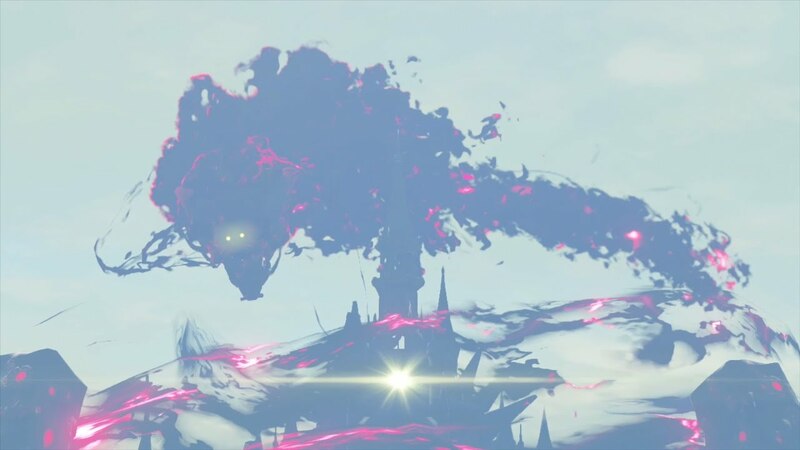 Now, post-apocalyptic games are a dime a dozen, but like I said, BotW is a beautiful, idealized dystopia, reclaimed by nature and surprisingly peaceful, if you don’t mind the tar-dripping dragon-snake that circles a ruined castle far off on the horizon. Eventually, of course, Link must fight that dragon-snake and restore civilization and order to the world — but that’s the goal, not the game. The game is like waking up 100 years in Earth’s future, freed of all memories of the nightmare years that lie in wait. Breath of the Wild is like surviving climate change’s worst calamities and reverting to my childish self — like P. in France, skipping along in a fantasy world full of magic, collecting relics of a forgotten world. I don’t mind escapism. Heck, I practically do it for a living. And at the end of a day, we all owe ourselves a bit of down-time. But I’m worried about how easy it is to get hooked on such a beautiful lie. Because no matter how hard I try to hide my head in the video game console, the future is still coming. And I have a princess right here, in my house, that needs to be rescued from it. This entry was posted in Uncategorized and tagged mario, sabbatical, video games, zelda.